Lighting the green alley in Lund. To test various methods of lighting in walking and bicycling environments that can enhance attractiveness, safety and increase people’s use of outdoor environments. A physical toolkit at four different locations along the route with several lighting installations. 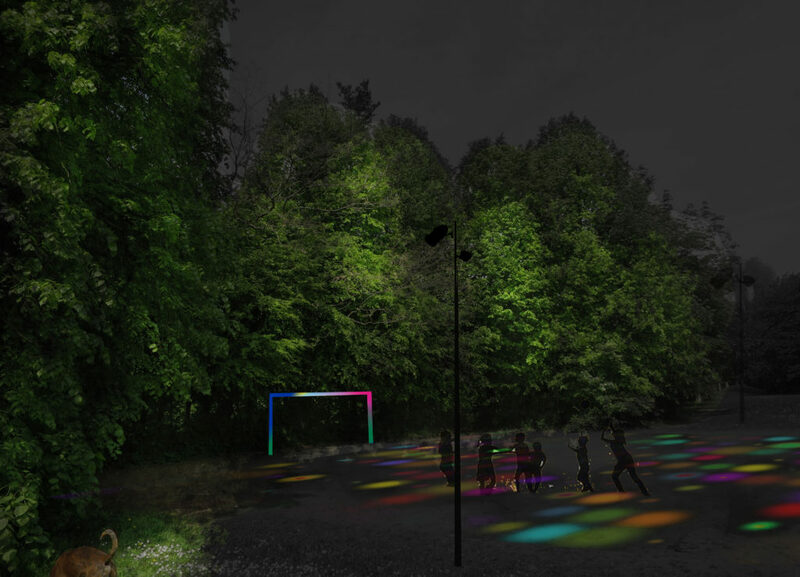 In the project, the municipality has collaborated with the Department of architecture, environmental psychology at LTH, Lund University and with two lighting designers, JH ljus og rumsgestaltning (light and spatial design) and YOKE. Through this cooperation, the municipality of Lund has been able to develop lighting ideas creatively and in a way that is different from what the municipality would usually do. Lighting Metropolis has given the city of Lund the chance to work with lighting in a new way, both in terms of process, technology and standards. The focus has shifted from elementary standardized lighting to daring to try something new. Our approach has been to work with both workshops and test lamps to try new ideas both in thought and reality. Safety and the value of the experience have been central concepts for dialogue and design. Lighting Metropolis has, through the meetings and study tours organised, given the municipality of Lund the opportunity to deepen their knowledge of lighting. Even at the political level, the project has helped elevate lighting issues within the municipality. 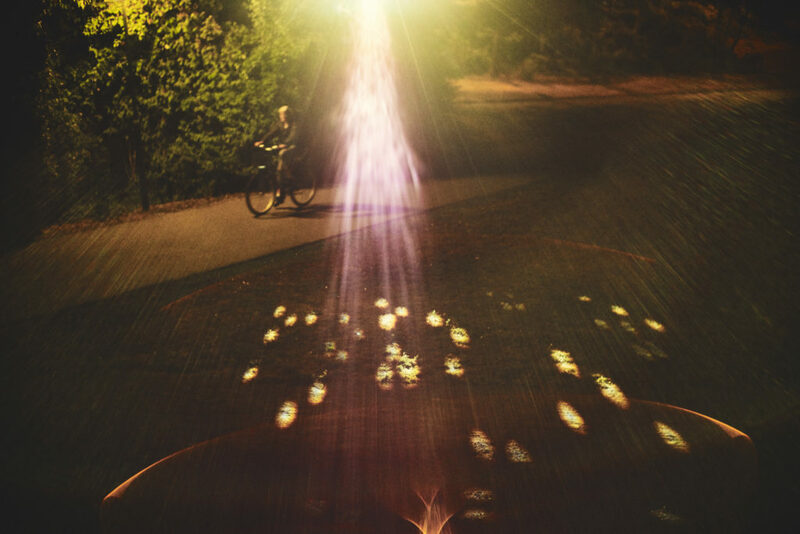 In the demonstration project, the municipality of Lund has worked with a lighting development of the northern part of the green bicycle route, from Kung Oscars Väg to Nöbbelövs Torg/square. 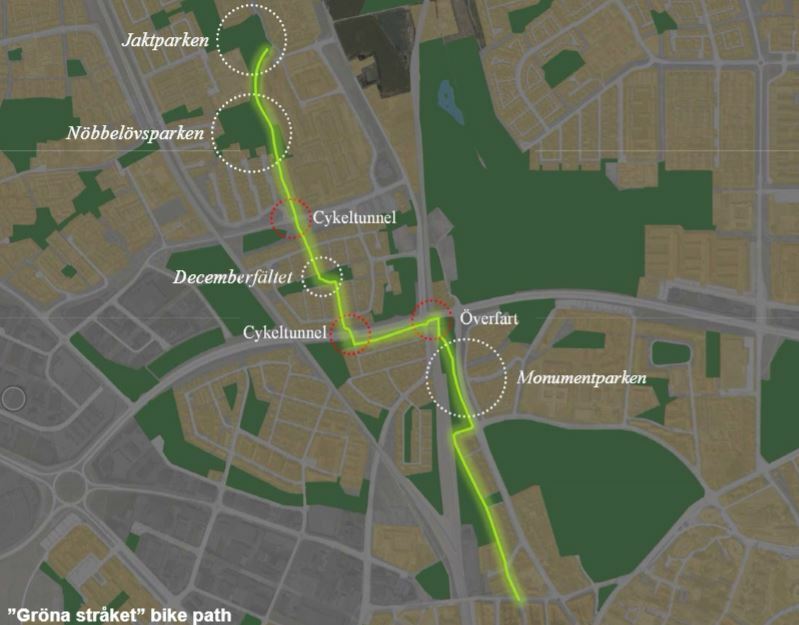 43% of all traffic in Lund takes place by bike and the chosen route is one of the busiest bicycle thoroughfares in Lund. 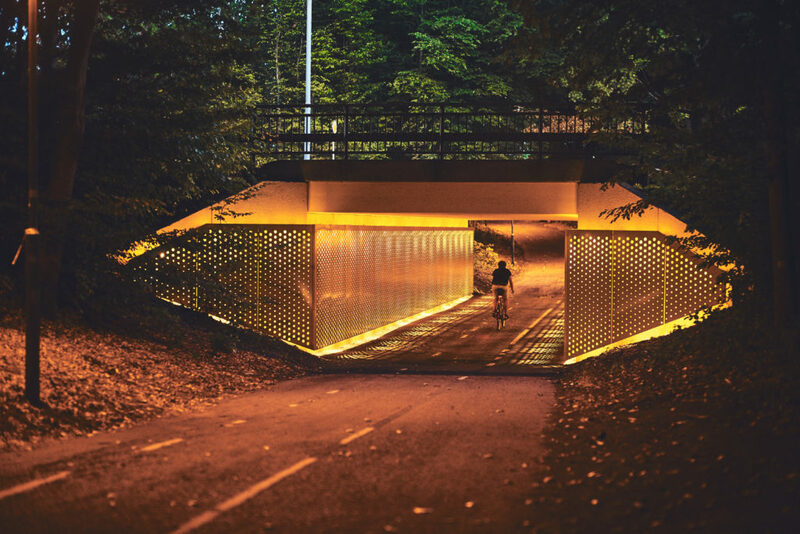 In these street environments you will find many of the challenges the municipality of Lund is facing, when it comes to developing lighting for pedestrian and bicycle users. The route passes through parks, residential neighbourhoods and both above and below heavily trafficked roads. Design-wise, the neighbourhood spans a neighbourhood built in the 40s, through the 60s of urbanisation at Oscarshem and on towards the 70s’ area of Nöbbelöv. When the route is primarily a cycling lane, but also combined walking and cycle paths, the cyclists and pedestrians are the focal point. Through lighting, you can tie together streets and park roads within the corridor. On stretches that have no surrounding buildings, the feeling of space can be highlighted by illuminating the surrounding vegetation or landscape formations. We have a particular focus on the impact of indirect lighting on the street. It has been about how transitions between well-lit and less enlightened places can be evened out, how the lights in surrounding park or street spaces can contribute to spatial awareness, identity and security and how the lighting may to a greater extent activate the route, even at darker hours and through the darker season. Researchers, Environmental Psychologists, Lund University – Faculty of Engineering and Faculty of Environmental Psychology, Maria Johansson, Torbjörn Laike; Lighting designers, JH Lighting and spatial design – Johanna Hernaeus, YOKE – André Maia; Lighting planner and Installer – Kraftringen, Staffan Åkerlund; Lighting control – Mediatec Solutions; Suppliers, Lighting – Fergin, Selga, Fagerhult, iGuzzini, MSL International AB; other suppliers – Plåtexpressen, Tages målerifirma; land contractors – markentreprenad, Green; project Manager – Municipality of Lund, Susanna Sonesson, Maria Sjögren. In the park, a monument was erected in the late 1800s in memory of the battle of Lund in 1676. The monument was erected for fraternization between Swedes and Danes, and is a symbol of peace between the two nations. The surrounding park dating from the 40s has been designed around the monument and its history. Its role has been toned down since, because it has been exploited by nationalist interests. With the new lighting, the monument’s resumes its position in the park. 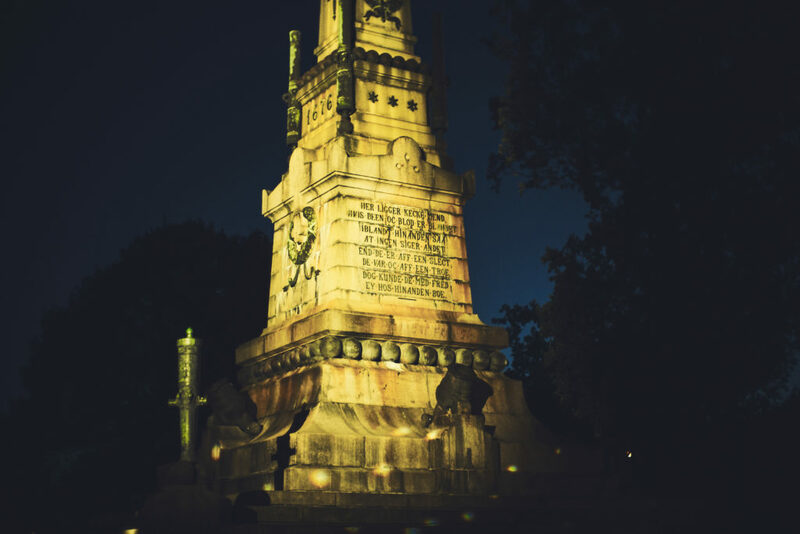 The lighting of the monument has been achieved with three projectors, shielded so only the monument is illuminated and no spill light falls on the surrounding vegetation. Three more projectors add a brilliant shimmer at the monument’s base. Around the monument, poppies will be a symbol of peace. When the poppies sway in the wind, the shimmer will come to life. The light source of existing spherical fixtures has been replaced with a light source of with lower effect so as not to compete with the monument’s new lighting. Complementary ground floodlights have been installed to provide a holistic experience and enhance safety when moving through the park. A regular pedestrian and bicycle tunnel like so many others is perceived as cramped and unsafe. The original lighting was harsh and glaring, creating a stark contrast to the darkness outside. 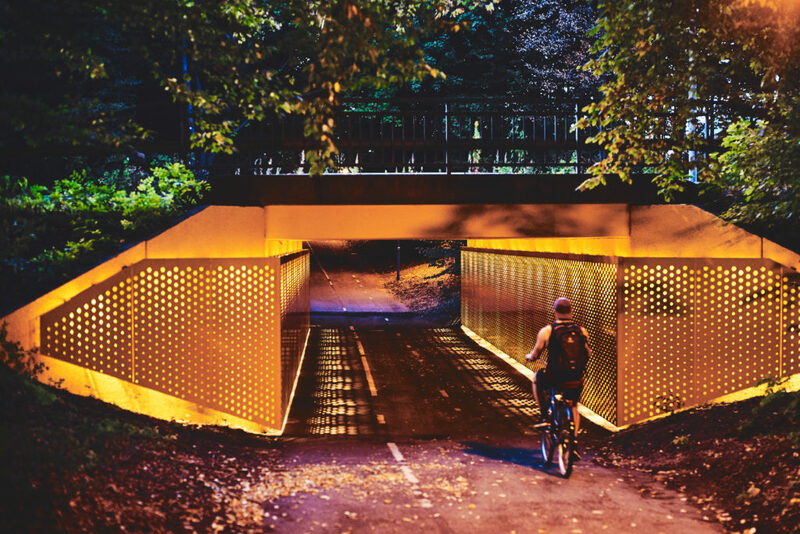 The tunnel has now been lit with indirect lights with downward LED fixtures behind perforated steel plates decorated in a warm yellow colour, evoking the form of a beehive. (The plan is to get the light to slowly pulsate to add extra life to the tunnel, increasing the association with a live beehive. At present, we do not know whether we will succeed with this. We will get the answer to this before the summer). The roof is fitted with a grazing light from seven fixtures. The goal has been to create a lighting environment that is warmer and softer and that does not deviate so much from the lighting scheme outside the tunnel. Traditionally, pedestrian and cycle paths are illuminated with pole luminaires at an even distance between the posts. This is to create a uniform light distribution for the road user. In one stretch of the path, we want to test a new approach by setting higher poles slightly off the pedestrian and cycle path and, to some extent, hide the poles and luminaires from the viewer, creating the experience that you are traveling by moonlight. You don’t see the source of light, but it is still bright, and the light is filtered through the foliage of the trees. The pedestrian and cycling path runs through a dark park in a large residential area. Through lighting, activity areas which are empty when darkness falls, may get renewed life even in the evenings, attracting visitors. The park is thus also perceived safer for passersby. In this project, we have chosen to work with a gravelled football field. Through light and sound, we create a place for those who live in the surrounding residential areas to meet up in the evenings and play football or just hang out. For this project, a new product has been developed in the form of a translucent bollard with a light fixture. On the bollard, there is a button. When you press the button once, a plain white lights up the field. Press once more to turn the playing field into an explosion of colour. Even the football goals light up in colours. In connection with the field, a bench has been built with a public address system which you can connect to by using a telephone. You can then choose to play your own music. The football field has been transformed into a Disco football field! The site’s identity is elevated at night compared to traditional solutions. Cooperation with lighting designers has contributed to enabling unconventional solutions. Safety – Light in the right place. Indirect lighting. Combinations of non-traditional lighting provide a holistic approach that provides the user with a more varied experience. This is in contrast with the common practice of functional lighting. Increased attraction – target points and variety along the way add value along the route, such as to and from work. Light that moves, not static. IT technology. App for controlling lighting. Follow-up survey is carried out when the plants are in place and it is dark in the evening. Scheduled for Oct-Nov 2018. Working with innovation requires patience, energy, commitment and time. The municipality of Lund has assumed a basic starting point in terms of the level of working with lighting in a non-traditional way. We have a lot to learn, and we have learned many new things through the project. It has become much more expensive than we thought from the beginning. New lighting in a site also requires other supportive actions such as pruning of vegetation, replacement of equipment and improvement of the land surface. This also means increased associated costs for the municipality. But without these measures, the new lighting installations would not have come completely into their own. The planning of the demo project did not take into account the bright summer months when it is difficult to conduct questionnaire surveys with the public. Painting and excavation work had to be delayed because of the cold weather.. Damp weather during the winter months complicated the installation and fine-tuning of lighting installations. We have received many new ideas to work with in the future. An example is walking and cycling areas where we can use motion sensors to control the lighting as needed. Even our view of conventionally lit footpaths and cycle paths with lighting columns line up has been broadened, and we see other opportunities to work with the entire city and park spaces instead of just focusing on the street. Ideas that came up during the process, but that have not materialized, can find a place elsewhere in the municipality. The project has helped us to “shed light on the light” within the organization which can contribute to lighting in the future playing a larger role than in today’s planning. Through questionnaire # 1, which was carried out within the project, we have seen that the greater amount of light does not directly provide an increased perception of safety, and also that a dimly lit environment can be perceived as safe and cozy. It is thus important that lighting efforts build on a case-by-case basis and do not jump to conclusions of a more general nature.